It’s Fall, ya’ll! Time to bring out the cozy sweaters and light those scented candles, because fall is finally here! 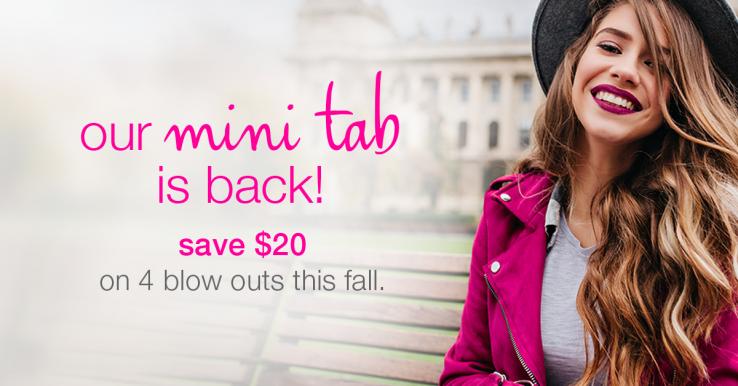 What better way to celebrate than with our fall mini tab? It’s the perfect opportunity to try a tab on for size! You might be wondering, what’s a mini tab? You can gift a tab to anyone – your favorite boss babe, bestie, sister, daughter or treat yo’ mama! The limit is 5 tabs per Guest! Hurry because this sale only runs from October 22 – November 4th, 2018! Contact your local Blo Blow Dry Bar to take advantage of this HOT offer! P.S. Want to WIN a FREE mini tab? Head on over to our Instagram because on November 1, 2018, we’re giving one away!